Although value stream mapping is often associated with manufacturing, it is also used in logistics and supply chain management, service related industries, healthcare, software development, product development, and administrative and office processes. Value stream mapping is a lean manufacturing technique that analyses and designs the flow of materials and information required to bring a product or service to a consumer. At Toyota, where the technique originated, it is known as “material and information flow mapping”. It can be applied to nearly any value chain. But how can you use this in your team? 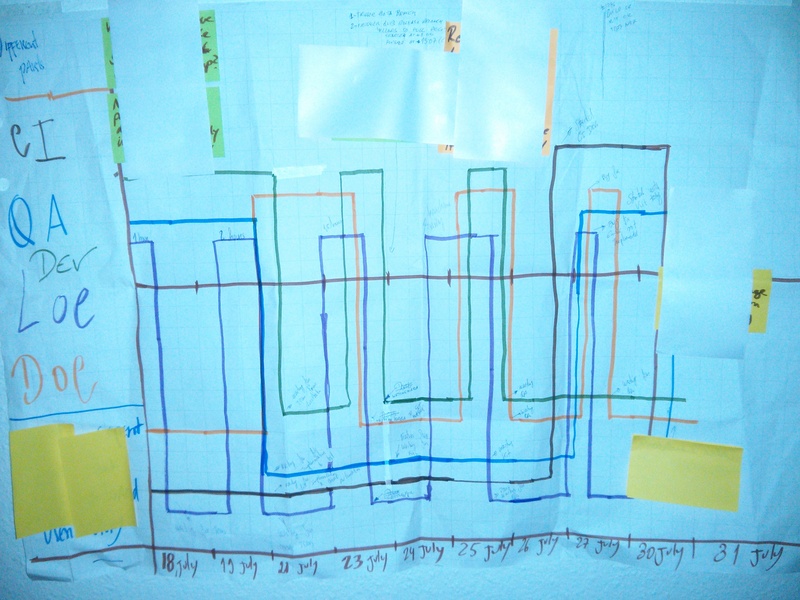 Value Stream Mapping is more suitable for mature teams. This exercise helps to show the ways a team and a system interact. People who are new to agile won´t probably understand most of the things this exercise brings. Why? As an example, the most common issue this exercise reveals is the QA/Loc documentation tail for each story. If the team is not mature enough, they won´t see it as a problem. Therefore, if you´re a mature team, go ahead and use this exercise, it helps you to uncover some complex problems. The easiest way to do this is to grab some flip-chart papers and tape them on the wall, then divide the space in equal intervals, each interval represents a day of the iteration. Draw a line on the Y axis, this line should be on the position Y=0. If they are doing any activity that will bring value to the customer, tell to each member to draw a line on top of the Y axis line. On the other hand,draw a line under the Y axis line, if they are waiting or blocked by something. Teams must do this activity everyday to track all different activities inside the team. Do not forget to write notes when people are blocked or in IDLE; these notes are important to be discussed in the retrospective. The possible result can be something as the picture on the right side. If a team is very mature, all QA activities that are performed as validation instead of bug fixing or being part of development, should be considered a waste. As an example, Unit Testing, TDD, ATDD and some other techniques can be considered QA activities as a part of development. If we do a testing at the end just to validate that everything is fine, then consider this as a waste. Bug fixing can be considered as a waste too. The team needs to do this activity everyday in order to track all different activities inside the team. Do not forget to write notes when people are blocked or in IDLE; these notes are important to be discussed in a retrospective. 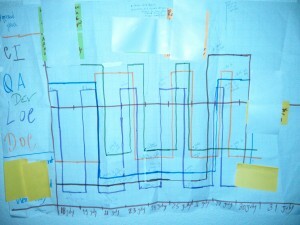 We guarantee you that you will have plenty of data for your retrospective at the end of the iteration.